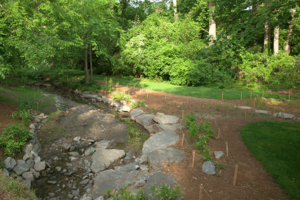 The South Fork Peachtree Creek Restoration Greenway includes six miles of creek trails and crossings that create a new pedestrian connection between Buckhead to Emory University. 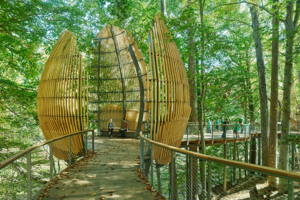 The intent of these plans is to establish the Creek corridor as a place where designing with nature allows spaces for people to explore and observe without disturbing the essence of this place. The plan proposes built elements that lay lightly on the land and that fit the character of the setting. Trails and crossings are designed with the natural topography to minimize land and floodplain disturbance, to avoid the 25’ riparian buffer wherever possible and to create accessibility that inspires the incremental restoration and stewarding of fragile and beautiful riverine habitats and view corridors. The physical experience of the trail is designed to maximize the aesthetic and ecological experience of walking in nature. 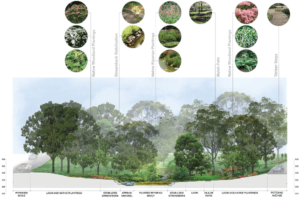 Important views and natural landmarks are highlighted, and the spatial interplay between open space and forested glades and dense forest is considered in a way that creates, we hope, a beautiful overlay between trail and the diversity of the natural environment.